Frankenmuth, known as Michigan's Little Bavaria, is one of the major tourist destinations in Michigan. If you are from Michigan, chances are you've been there more than once. It is a very cute little town with many things to do. This is one of my favorite places in Michigan. My favorite thing to do is shop at Bronner's Christmas Wonderland, the world's largest Christmas store, open year round. I could seriously spend all day there. We love spending time in the picturesque downtown, which often has small festivals or events going on. Although it is a great place to visit in summer, we enjoy taking small vacations there in the winter as well. Not only is it beautiful when it's covered in snow, but there are also many things right in the comfort of your hotel if you stay at either Zehnder's Splash Village or the Bavarian Inn Lodge. We usually stay in the Bavarian Inn Lodge, with it's shops, restaurants, bars, 4 indoor pools, indoor miniature golf course, table tennis, and pool tables. Some people come to Frankenmuth for the ambience, family activities, nearby outlet shopping, or the cool hotels, while others come for the fudge or the famous Chicken Dinners. In a town with a heavy emphasis on meat and dairy foods, I was worried that I wouldn't be able to fully enjoy Frankenmuth when I went veg. I always had to pack enough PB&J sandwiches to last the whole trip, but the times they are a-changin' my friend. It is now possible to get more than just a side salad in Frankenmuth! Two of the main restaurants, The Bavarian Inn and Zehnder's now both have (small) vegetarian menus and there are vegan options at each. Make sure that you ask for the vegetarian menu. I'm really glad that Frankenmuth is expanding it's vegetarian and vegan food options. However, given the choice, I would still drive the half hour to Heather's Restaurant in Bay City for many more great vegetarian and vegan options. Update: Heather's Restaurant in Bay City is now closed. For another great breakfast or brunch option, check out La Crepe du Jour (more info below). If you want to have the Frankenmuth Dining experience, I would first recommend the Bavarian Inn Restaurant. The Bavarian Inn Restaurant has two vegan meal options: Quinoa Vegetable Stir Fry and Vegan Chili. Both options were good, but we very much favored the chili. The Stir Fry is a curry lime quinoa pilaf with a blend of fresh steamed vegetables. It is accompanied by a side salad with vinegar and oil. This was a light, healthy meal with very mild seasoning. Do not let the word curry fool you if you are not into spicy food. This dish is not spicy and does not resemble an Asian curry. The Chili is a hearty blend of sweet potatoes, quinoa, beans, and vegetables in a seasoned roasted vegetable and tomato stock topped with sliced avocado. The Chili was definitely heartier, more filling, and more flavorful than the Stir Fry. Both are good options. In my opinion, they are probably the best options in Frankenmuth. These two vegan items are listed on both the lunch and dinner menus. The difference between the lunch and dinner options is a whole bunch of endless side items which are not vegan and the server may not be aware that you don't want things like buttered noodles, cole slaw, etc. I recommend ordering the lunch portion which does not come with all of these items that you can't eat but pay extra for, unless you are able to work out some substitute sides with the server and chef. Located directly across the street from The Bavarian Inn Restaurant is Zehnder's, another one of the famous Frankenmuth Restaurants. Zehnder's can also make vegan food, but we found the whole experience to be confusing and almost slightly suspect. Here is our experience from the last time we visited Zehnder's - we called ahead and were told that there were many vegan options, but when we arrived and checked out the vegetarian menu, none of the items were vegan. Our server was very confused and thought that there was nothing we could eat there. We gave him some questions for the chef - to see if maybe something could be modified to fit our diet. He also found a vegan server who offered us her help, but the options seemed quite limited - salad, plain baked potato, maybe cranberry sauce? In the end, the chef was able to modify something and we essentially got some bread with sauteed vegetables on top of it. I wasn't all that happy about this since I thought that they had actual vegan options on the menu, but it was actually very tasty and I would eat it again in a pinch. Update: Probably our new favorite place to eat in Frankenmuth is La Crepe du Jour. They offer gluten-free, vegan crepes. While they may not have a ton of vegan options listed on the menu, the staff is happy to help you create your own or customize one of the existing options to make it vegan. There are plenty of sweet offerings. We also really enjoyed combining different veggies with salsa. La Crepe du Jour is located in the River Place Shops outdoor mall, right in the heart of downtown near both the Bavarian Inn and Zehnder's. 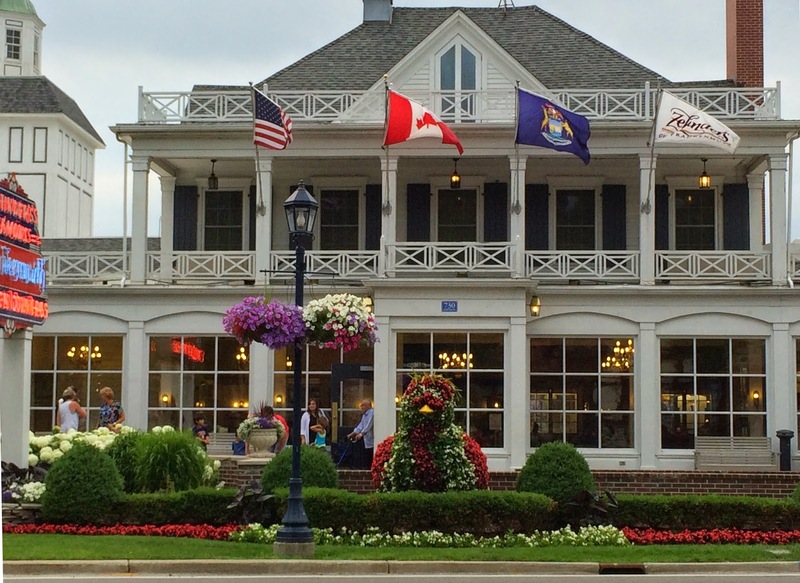 If you are planning a trip to Frankenmuth, there are a few other food options to consider. There are two Chinese Restaurants in Frankenmuth - Szechuan House and Panda King Buffet. They are not in the most premium location like the Bavarian Inn and Zehnder's, but they are still within walking distance if you do not have mobility issues or crazy winter weather to deal with. We have eaten at the Szechuan House before. I don't remember what we got, but we talked to the person working and they were able to make us something vegan. Poblano's Mexican Grill & Cantina does not list any vegetarian items on their menu, but said that they can make something vegetarian and that their rice and beans are vegetarian. There is also a Kroger Grocery Store a little further down on Main Street and a 24-Hour Meijer Store near the I-75 Frankenmuth exit. Both have vegan options. Nearby Birch Run, home to outlet shopping, offers Starbucks and Taco Bell. They are only about a 15 minute drive from Frankenmuth. Have you ever been to Frankenmuth? Do you bring your own food or find vegan food in or around town? What's your favorite thing to do there? They do such a beautiful job decorating the town. If you come to Michigan, it is a very cool place to visit. The avocado was so good on the chili! Id also like to add that La Crepe du Jour, Creperie & Cafe in Riverplace offers Vegetarian options. Hi! I'm vegan and headed to Frankenmuth tomorrow (in a snow storm!) ... also staying at The Bavarian Inn. Was glad to find this article. It's been a few years since you posted it, it looks like, but we're definitely going to ask about the vegan chili! Hi Lisa! Sadly, Heather’s Restaurant in Bay City is now closed. The Bavarian Inn still has the chili and other vegan option though. Also, there is a crepe place with vegan crepes in the outdoor mall next to the Bavarian Inn.